The Department of State Security (DSS) is detaining Senator Enyinnaya Abaribe for alleged gun running and aiding and supporting the proscribed Indigenous Peoples of Biafra (IPOB). The search came moments after the Senator representing Abia South was picked up by security agents at Transcorp Hotel, Abuja. The search warrant was dated June 2, 2018. Ume said the ‘excruciating search of all corners and every item’ in the house lasted from about 5pm till 11:15pm on Friday. He also said 27 items were taken from his client’s home none of which was a gun or ammunition. His words: “but unfortunately, two of the 27 items include the two handsets of two USA citizens found in the house. Ume said he was worried at the turn of events because when the leader of IPOB, Nnamdi Kanu, was due to appear in court on October 2017, his house was brutally shut down in September. “Senator Abaribe, the surety to Nnamadi Kanu, is to appear in court on 26th June 2018, but on 22nd June 2018, Senator Abaribe was arrested and detained incommunicado,” he said. 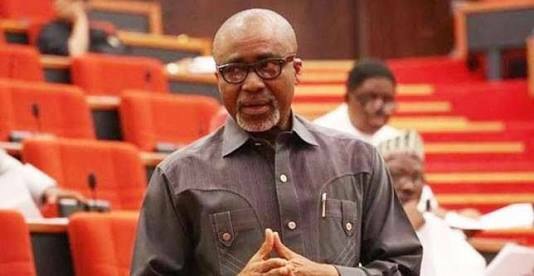 Giving the background to the arrest, Ume said: “Yesterday (Friday) in the forenoon hours, our Senator Enyinnaya Harcourt Abaribe, a high ranking senator of the Federal Republic of Nigeria, was arrested by officers of state security services. “His arrest was as shocking as it was curious. “As his counsel, I have, long ago, complied with DSS stipulation for meeting with its detainees. “I have also requested for a meeting with the D.G of the service to know the reason for his arrest. “All fell into refusal ears. At about 4:45pm, I was alerted that officers of the services were heading to the senator’s residence. “I had to break my long wait at the DSS Headquarters and rushed to the senator’s residence. Ume claimed Abaribe’s arrest was motivated by his opposition to the federal authorities. Ume also said that Abaribe’s revelation that N30 billion was smuggled into the budget of the Power Ministry without the knowledge of the Senate Committee may have also been one of the reasons for his arrest.